Macadamia Nut Fudge is a rich, decadent, and silky smooth chocolate treat. And a little crunch from the macadamia nuts never hurts! The struggle is real you guys. You know, the one that occurs mid-summer when everyone is sharing photos from vacation and all you want to do is be sitting on a beach drinking a Mai Tai. Only, I was one of those people who was sharing those pictures back in May. Our family went on a wonderful 2 week vacation to Hawaii. We had the best time ever, and while I normally say I don’t like to “repeat vacation”, this is one I would do over in a heart beat! While on our vacay in Hawaii, I happened to stumble upon some Hershey’s Kisses with macadamia nuts inside. This bag of chocolate made it’s way into our cart, and was devoured within days! Of course, you can’t find them on this side of the ocean. Unless one of those said Hershey’s Kisses made it back home in the bottom of your purse. Normally, I would NEVER eat anything from the bottom of my purse, haha, but this Kiss was eaten with no second thoughts! I wish Hershey’s sold them here in Illinois! So, I did what any good foodie would do. I recreated them. And boy, this Macadamia Nut Fudge is amazing. 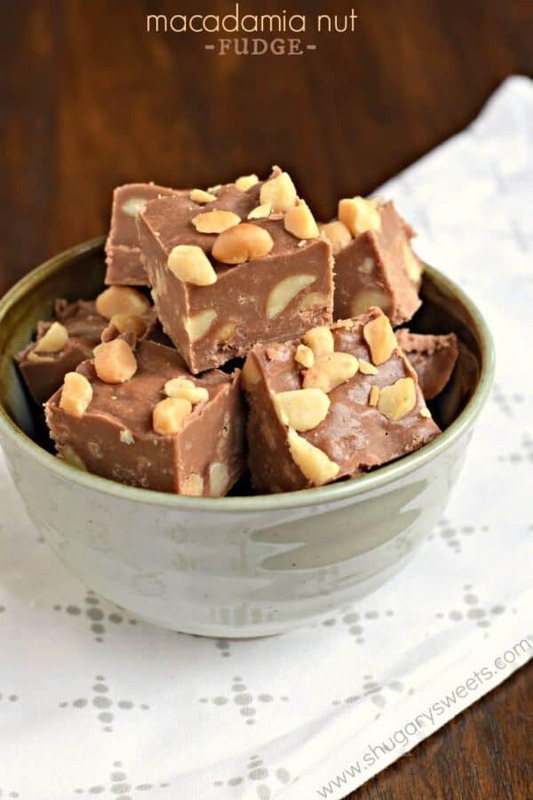 Unlike the Hershey Kisses with only one little nut inside, this fudge is chock full of nuts! Every bite is filled with crunchy macadamia nuts and creamy chocolate fudge. DON’T WORRY!! No thermometers needed for this easy recipe! The hardest part about this recipe is waiting for the fudge to be ready to cut (about 4 hours in the refrigerator)!! 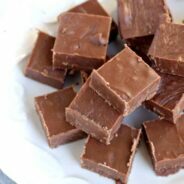 With my method, learning how to make chocolate fudge is as easy as can be. Now, how I do convince my hubby that we need another vacation ASAP? Are you going anywhere fun this summer? Did you already take your vacation? Tell me about it so I can live vicariously through your stories!! 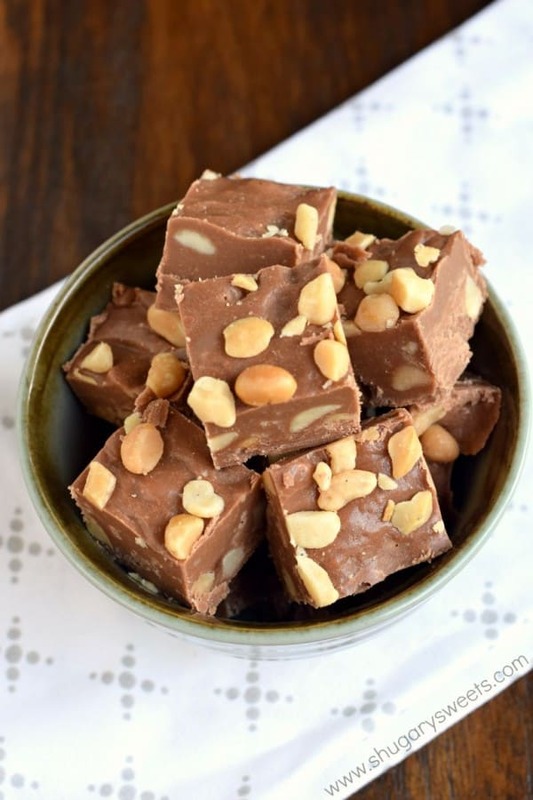 I shared this Macadamia Nut Fudge recipe over on Food Fanatic. Be sure to print it out! Hawaii must be the happiest place in the world. Beaches, warmth, macadamia Kisses…I am DYING to go there and take pictures that make other people all jealous! This fudge is da bomb, as usual, Aimee. Thick and gorgeous! What a great combination! Hawaii knows what’s up. This looks amazing! I’m such a frugal girl when it comes to cooking/baking but I will say my one splurge is macadamia nuts! You can’t beat the flavor or texture. Can’t wait to try =) Anyhow, did you know the local grocery store worker just told me that people cheap all the time buying these nuts, they print off that they are hazenuts ($3.99) a pound instead of macadamia nuts ($16.99) a pound. That is so wrong! HERSHEYS KISSES WITH MACADAMIA NUTS ARE A REAL THING THAT EXISTS?! I NEED THAT. Holy yum that sounds amazing, and I am loving that you recreated that into this fudge. You can NEVER go wrong with chocolate and macs! Pinned! What a great find! 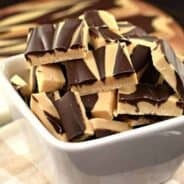 My husband would LOVE this fudge! And I definitely think you need to redo Hawaii- what an amazing trip! Ohhh macadamias… I don’t buy them frequently, but when I do, they are such a treat- buttery and nutty 🙂 Pinning this fudge! Ohhhhh man i haven’t had chocolate covered macadamia nuts in forever! This looks amazing! I haven’t been to Hawaii in years but I love it and would love to go back. And this fudge looks amazing. However, I would need to replace the nuts. I just got back from Maui last month and I want to go back as soon as possible! Hawaii is the one vacation you never want to leave from, and you’re so lucky you got to go for 2 weeks. I wish they sold those Hershey’s kisses here, but hey — we don’t need them when we have this fudge! 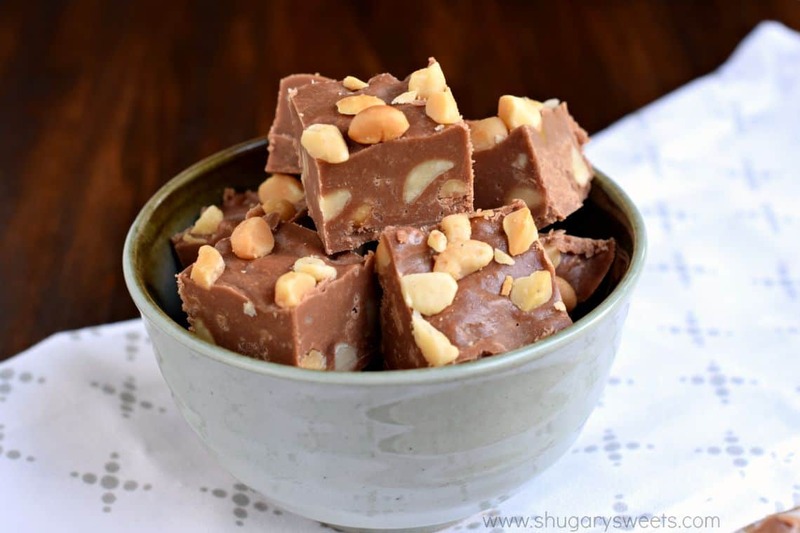 Plus this fudge has way more macadamia pleasure….love this! I love macadamia nuts and chocolate! And I’m totally jealous — I’ve never been to Hawaii but would love to go! I brought home 4 bags of those Kisses and ate an entire one last weekend. LOVE THIS! You’ll love this fudge even more! Has more nuts in it…which is necessary. Wow, this sure looks good! I love me some macadamia nuts! This looks fantastic Aimee! I have yet to go to Hawaii and it sounds like I need to make that happen ASAP 🙂 Then come home and make this fudge! Would you believe I have never made fudge? I love it though, so I need to start giving it a try! Your recipe looks so yummy! Oooh macadamia and chocolate is a match made in heaven! 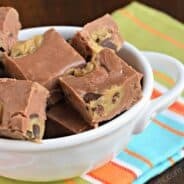 This fudge looks absolutely wonderful! I LOVE fudge. I usually only make it around christmastime so I don’t eat whole pans by myself but I might make an exception and make this now. Looks so good! Thanks Shawn!! I seriously make fudge year round, and not just because I’ma blogger, but because it’s such an easy treat to keep on hand for family gatherings, hostess gifts and more! Can i use condensed milk instead of marshmellow cream? I live in South Africa and don’t think we get it here. Unfortunately I don’t think it would give the same consistency. If you have regular marshmallows, use about 25 of them. This fudge looks wonderful. Can you use whole milk instead of skim? It is what I have on hand. That will work great too!